If you have been looking for a bird cage you have probably seen a few flight cages crop up during your research. And you might have even wondered, what is a flight cage in the first place? 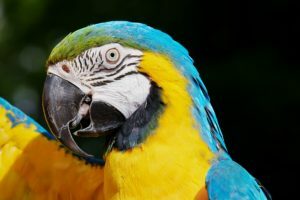 In the following article, we will go over the main attributes of a flight cage, and what you should take into consideration if you choose to buy one. 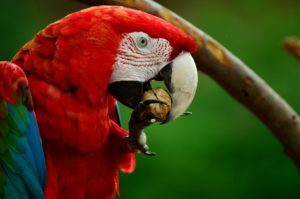 A flight cage by definition is any cage that is large enough for a bird to easily fly around in for more that a few wing beats. 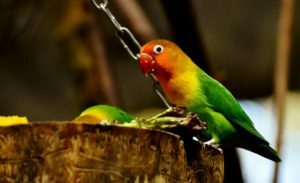 Most flight cages are intended for smaller birds like parakeets and finches since most commercial flight cages are intended for use indoors. There is some overlap between flight cages and aviaries. 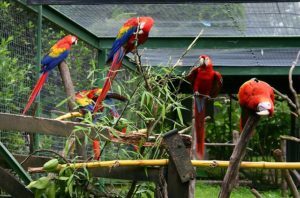 In most cases, aviaries are constructed outdoors, and they are very large. And they are usually reserved for larger birds like parrots and macaws. For the sake of this discussion, we will focus on flight cages for use indoors. 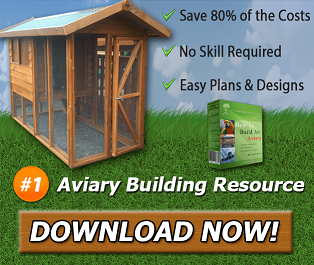 But if you need a very large outdoor bird cage, you can find out more about aviaries here. Flight cages are usually larger than ordinary cages, which means they will take up more room in your house if you choose to get one. If space is limited in your house then a flight cage might not be the best option. Smaller flight cages will be about double the size of an ordinary cage for any given type of bird. And large to medium sized flight cages will take up anywhere from 5 to 8 square feet of floor space in whatever room you plan on keeping them. 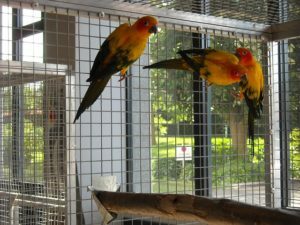 Flight cages generally offer more horizontal and vertical space than ordinary cages. The added space allows a bird to truly stretch their wings and fly. 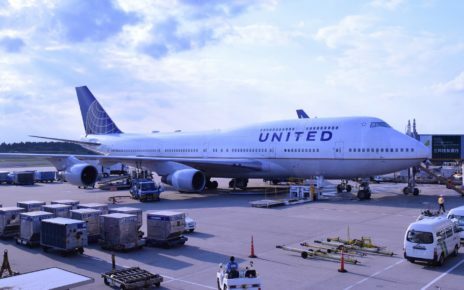 Horizontal space is usually more important than vertical space when it comes to flight cages. The reason for this is that birds will usually hop and jump when they want to get to higher locations in their cage. But when they really want to fly they will fly straight across their cage to really get the sensation of flight. 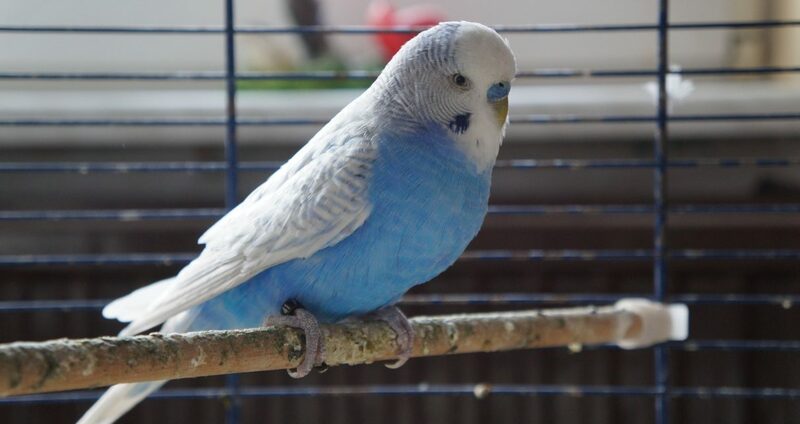 When selecting a flight cage you have to take into consideration the size of bird you plan on keeping, and how many you intend on placing in the cage. If you just want to keep a few finches or parakeets a small flight cage will do the trick. 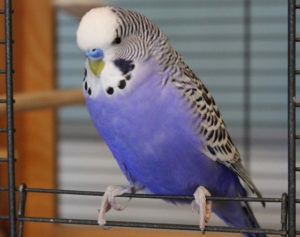 If on the other hand, you want to keep 5-10 small birds, they will fit into most medium to large flight cages. 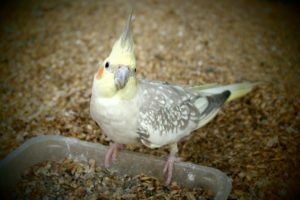 Medium sized birds like cockatiels and parrotlets will need a large flight cage and will have to be housed in smaller numbers in order for them not to be overcrowded. 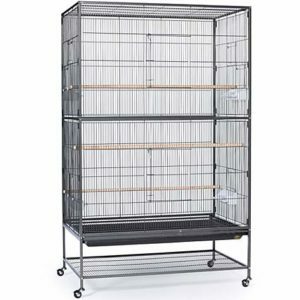 The HQ Black Aviary Flight Cage (Buy Online) offers the space your birds need at an affordable price. 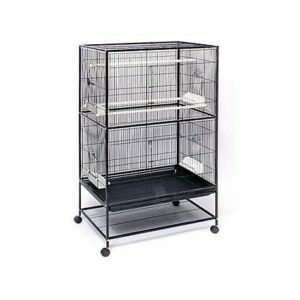 Included with this cage are two large plastic feeders and two solid wood perches. This cage also comes with a stand with built-in casters, which makes it very convenient if you want to move this cage around your house. This flight cage is large enough to house five to eight small to medium-sized birds. Or you could keep a smaller number of medium to large birds comfortably in this cage. The dimensions of the cage itself are 32 in. L x 21 in. W x 35 in. H. And the cage will have a total height of 60 inches when it is placed on the included stand. When you consider how much cage space you get for the price you really can’t go wrong with the HQ Aviary Flight Cage. Your birds will have lots of vertical and horizontal space to fly around in. 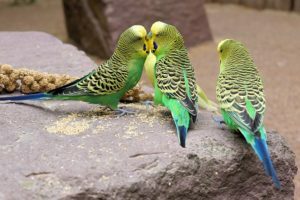 And since this cage has such a large internal volume, you can keep a small flock of birds in this cage without having to worry about overcrowding or territorial conflicts. 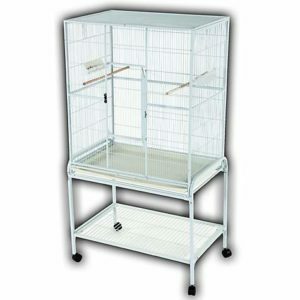 The Prevue Hendryx Large Flight Cage (Buy Online) is a well-designed cage with a lot of open space. Included with this cage are four plastic double cups and three long wooden perches. And this cage comes with a stand with built-in casters, so it should be easy to move around should the need arise. The dimensions of this cage are 31 in. L x 20.5 in. W x 52 in. H when mounted on the stand. That makes this cage suitable for 3-5 small birds like parakeets (budgies) or finches. The shallow depth of this cage will allow it to easily fit in small rooms without taking up to much space. While at the same time it will provide a good deal of room for a flock of small birds to fly around in and get some exercise. The A&E Cage Company Flight Bird Cage (Buy Online) is a high-quality flight cage that will last a lifetime. This cage comes with two wooden perches and two large plastic feeder bowls. And it is mounted on a sturdy stand with 4 easy to roll casters. The dimensions of this cage are 32 in. L x 21 in. W x 35 in H. And when the cage is placed on its stand it measures 32 in. L x 21 in. 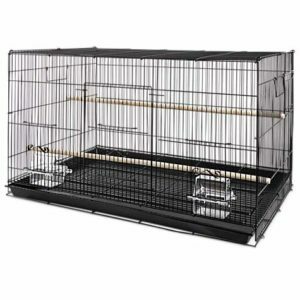 W x 63 in H. This cage will work well for small to medium-sized birds, or for a single large bird if you want to push it. 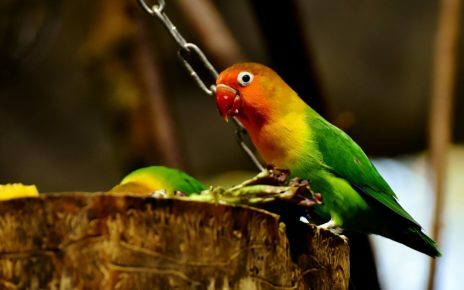 If you keep smaller birds like parakeets or finches you will be able to house 5-8 birds with room to spare. The A&E Flight cage has one large front door so you can get easy access to your birds no matter where they are in the cage. And the slide-out litter tray is resistant to stains and is very easy to clean with just a little light soap and water. If you need a durable and affordable cage that offers ample space for your feathered friends then the A&E Flight Cage is a great option. The Prevue F050 Wrought Iron Flight Cage (Buy Online) is one of the most spacious flight cages on the market. Included with this cage are four large plastic cups and three long solid wood perches. And the whole cage assembly is mounted on a sturdy metal stand with built-in smooth rolling casters. 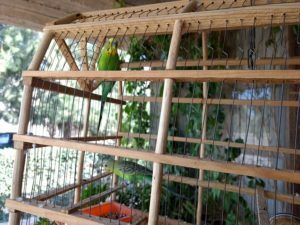 This cage is perfect for keeping a small flock of parakeets, finches or canaries. The dimensions of this cage are 37 in. L x 23 in. W x 47 in H. And when it is mounted on the stand it will measure 37 in. L x 23 in. W x 60 in H.
Getting access to your birds in this large cage won’t be a problem thanks to the two large front doors. You will appreciate being able to easily reach in to change your bird’s water and give them some food since this cage will easily hold up to 8-10 birds. And when it comes time to clean this cage the easy to remove litter pan is light weight, so cage maintenance won’t be a challenge even though this cage might be larger than you are used to. If you are looking for one of the most competitively priced large flight cages, then the Prevue F050 is really the best option. With a massive internal volume and a portable design, the Prevue F050 is one of the best flight cages out there. 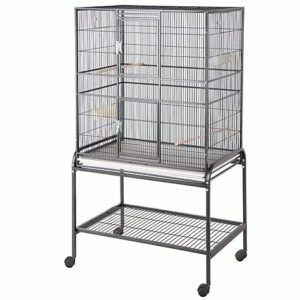 The Prevue Hendryx Flight Aviary Bird Cage (Buy Online) is a spacious cage with an attractive design. This cage comes with four large plastic double cups and two large wooden perches. And the cage sits atop a sturdy metal stand with built-in casters so it can be moved from room to room or even outside with little effort. This cage can hold up to 8 to 12 small to medium-sized birds like parakeets, finches or canaries. The measurements of this cage are 37 in. L x 27 in. W x 68 in. H when it is mounted on its stand. The roof does hang over a little bit making the actual length of this cage 42 inches, so you might need to take that into consideration when finding a suitable location for this cage. The two large front doors allow for quick access to the interior of this cage, so it will be easy to top off your bird’s food and water when you need to. And the pull out tray is compatible with a wide range of cage liners so clean up will be a breeze. 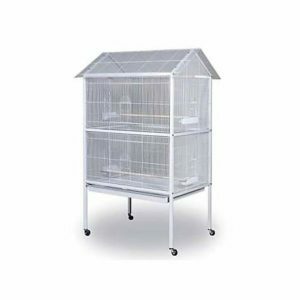 The Prevue Hendryx Flight Aviary White Bird Cage is perfect if you have a good-sized flock of small birds. If you want a good looking cage, that offers plenty of space for your birds, then you might want to give this cage a closer look. The Prevue Hendryx Flight Cage Kit (Buy Online) is a good starter flight cage for 1 or 2 small birds. Inside this cage, there are two plastic cups, two perches, and one solid wood ladder. And included with this kit is an accessory pack with a cuttlebone, mineral treats and a variety of toys for your birds to play with. This flight cage is one of the more compact models available since it measures 26 in. L x 14 in. W x 22.5 in. 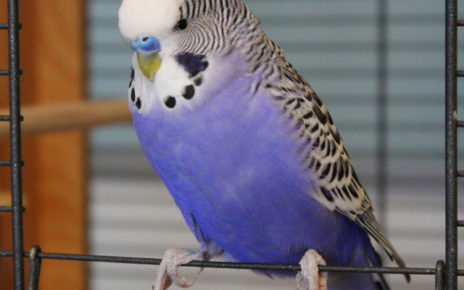 H. If you have a smaller bird like a budgie (parakeet) or a finch this cage will be more than adequate. 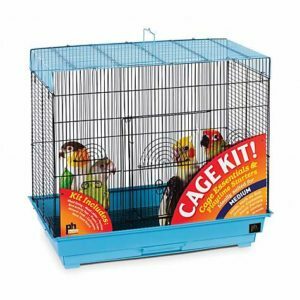 If you are a first-time bird owner and you need an affordable flight cage that is ready to go right out of the box, then the Prevue Hendryx Flight Bird Cage Kit is a very good option. The You & Me Finch Rectangle Flight Cage (Buy Online) is the perfect flight cage for someone who is on a budget. With a price of fewer than forty dollars, you won’t have to break the bank to give your birds a little extra space. Included with this cage are two covered plastic bowls and two solid wood perches. The plastic bowls are mounted in front of two small easy to open doors, so you won’t have to open the main door and risk your bird flying out to give them some water or food. This cage is suitable for small birds such as finches or parakeets (budgies). The measurements of this cage are 30 in. L x 18 in. W x 18 in. H. With a length of 30 inches a small bird will have ample room to fly around and get some exercise. For any one with a few small birds, this flight cage will work out fine. And since these cages are so cheap you can pick up a few if you want to have multiple sets of birds in their own separate cages.